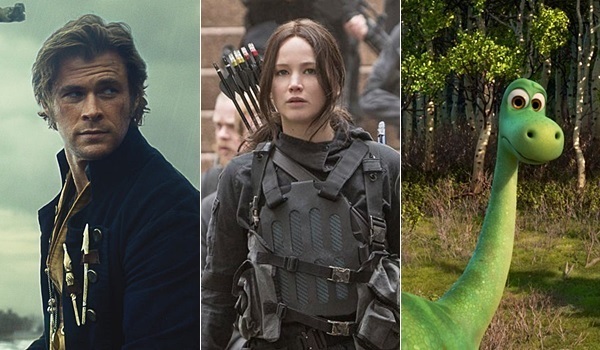 Sunday Update: While moviegoers continue to wait for the debut of Disney's Star Wars: The Force Awakens next weekend, it turned out to be a close four-way race for first place this weekend, with Lionsgate's The Hunger Games: Mockingjay - Part 2 leading the way with an estimated $11.3 million. The final chapter of the young adult blockbuster franchise starring Jennifer Lawrence has led the weekend box office for four consecutive frames. Mockingjay - Part 2 was down 40 percent from last weekend. That represented a solid hold, especially since the film lost IMAX screens to In the Heart of the Sea this weekend. In comparison, last year's The Hunger Games: Mockingjay - Part 1 fell 42 percent in its fourth weekend to gross $12.69 million. Mockingjay - Part 2 has grossed $244.49 million in 24 days, which places the film 12 percent behind the $276.88 million 24-day take of Mockingjay - Part 1. Warner's In the Heart of the Sea debuted in second place with a very disappointing $11.01 million. Expectations were already low to begin with for the pricey Ron Howard directed adventure drama starring Chris Hemsworth, but the film opened even lower than expected. In the Heart of the Sea opened 54 percent below the $24.12 million start of Exodus: Gods and Kings over the same weekend last year. Instead, the film performed much more in line with the $10.01 million launch of 2013's Rush. That stat is especially underwhelming given that In the Heart of the Sea was far more expensive than Rush and also had the added advantage of higher priced 3D and IMAX admissions. For Chris Hemsworth, In the Heart of the Sea marks another failed attempt at breaking out as a box office draw outside of his role as Thor. In the Heart of the Sea opened with $3.85 million on Friday (which included an estimated $0.58 million from Thursday evening shows), increased 12.5 percent on Saturday to gross $4.33 million and is estimated to decrease 35 percent on Sunday to gross $2.83 million. That places the film's estimated opening weekend to Friday ratio at 2.86 to 1. The audience breakdown for the film skewed towards male moviegoers (54 percent) and heavily towards moviegoers over the age of 35 (68 percent). In the Heart of the Sea earned a respectable B+ rating on CinemaScore, but the film's audience score on Flixster currently sits at a lackluster 64 percent. With the launch of Star Wars: The Force Awakens next weekend, it is hard to see In the Heart of the Sea holding up well going forward. The Good Dinosaur finished closely behind in third with an estimated $10.50 million. The 3D computer animated film from Disney and Pixar stabilized this weekend, as it was down 31.5 percent. 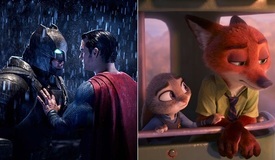 Historically, animated films experience strong holds this weekend on the heels of sharp post-Thanksgiving fall-offs. Despite this weekend's hold, The Good Dinosaur has grossed a softer than expected $89.66 million in 19 days. That places the film an underwhelming 22 percent behind the $115.40 million 19-day take of 2010's Tangled (which fell 34 percent in its third weekend to gross $14.33 million). The Good Dinosaur will obviously face much tougher competition next weekend with both Star Wars: The Force Awakens and Fox's Alvin and the Chipmunks: The Road Chip entering the marketplace. Warner and MGM's Creed claimed fourth place with an estimated $10.12 million. The critically acclaimed seventh installment of the Rocky franchise was down a very solid 32.5 percent. Creed has grossed a stronger than expected $79.32 million in 19 days. The film is currently running a healthy 31 percent ahead of the $60.64 million 19-day take of 2006's Rocky Balboa (which fell 43 percent in its third weekend to gross $6.02 million). With the holidays still ahead of it, Creed should hold up better from this point forward than Rocky Balboa (as a Christmas weekend release) did. Krampus rounded out the weekend's top five with an estimated $8.01 million. The holiday themed PG-13 horror film from Universal was down 51 percent from last weekend, which represented a respectable second weekend hold for a horror film. Krampus continues to exceed expectations with a ten-day start of $28.15 million. That places the film essentially on par with the $28.16 million ten-day take of 2013's Tyler Perry's A Madea Christmas (which fell 48 percent in its second weekend to gross $8.38 million). On the platform front, Paramount's The Big Short was off to a terrific start this weekend with an estimated $720,000 from just 8 locations. That gave the Adam McKay directed ensemble comedy-drama an impressive per-location average of $90,000 for the frame. The Big Short appears to have been aided by strong critical reviews and by having received four Golden Globe nominations on Thursday. The platform launch for The Big Short was fairly similar to the platform launch of 2013's American Hustle, which grossed $740,455 from 6 locations (for a per-location average of $123,409). The Big Short is scheduled to go into wide release on Wednesday, December 23. Saturday Update: Warner Bros. reports In the Heart of the Sea debuted to an underwhelming $3.845 million on Friday. Unfortunately, that's 57 percent below the opening day of Exodus: Gods and Kings, which bowed on this same weekend last year. Unprecedented anticipation for next week's Star Wars: The Force Awakens has clearly affected a number of movies during the late fall/early holiday market, and this is the latest victim of that. Heart landed a mediocre "B+" Cinemascore" and currently sits at 65 percent on Flixster (with a disappointing 44 percent on Rotten Tomatoes). 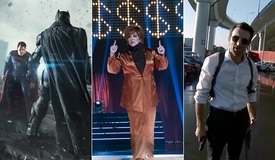 BoxOffice projects a $10.5 million opening weekend. Lionsgate reports that The Hunger Games: Mockingjay - Part 2 added $3.26 million in second place on Friday, off 42 percent from the same day last week. 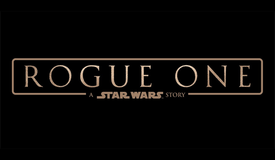 The franchise finale has now amassed $236.5 million domestically. BoxOffice projects a $10.9 million weekend, which would give it a fourth straight weekend first place finish. Creed claimed third place yesterday with a 34 percent week-to-week drop to $2.985 million. 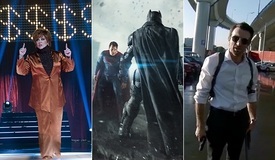 With $72.2 million in the domestic bank, BoxOffice projects a $9.9 million third frame for the strongly received film. Krampus took fourth place on Friday with $2.53 million, down just 58 percent from last Friday (a respectable drop for horror flick on its second Friday). With $22.7 million in the bag so far, look for a healthy $7.8 million sophomore frame. The Good Dinosaur rounded out the top five on Friday with $2.25 million, giving it a new total of $81.4 million. 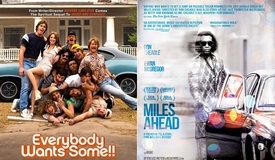 BoxOffice projects a $10.2 million weekend. Last but not least, Paramount's The Big Short got off to a stellar start in 8 locations with an estimated $221,928 opening day yesterday, making for a strong per-theater average of $27,741. That puts the strongly reviewed and multiple Golden Globe-nominated film on pace for a $640,000 opening weekend, which would give it a per-theater weekend average close to $80,000 -- on par with the likes of Lincoln ($85k), The Fighter ($75k), and Up in the Air ($78k). Friday Morning Update: Warner Bros. reports that In the Heart of the Sea bowed with $575,000 from Thursday night's first shows. That unfortunately falls 52 percent below the $1.2 million Thursday night start of last year's Exodus: Gods and Kings, which opened on the same comparable weekend. Based on last night's performance and pre-release social media trends, we're projecting the film will land in the low-to-mid teen millions for the weekend. This story will be updated as official reports come in. Follow BoxOffice on Saturday morning for early weekend estimates based on official Friday estimates from the studios.